It's really amazing how attached a person can become to their pet. They truly do become a member of the family. 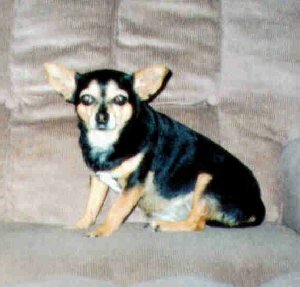 Our little chihuahua, Prissy, certainly was a big part of our family. She spent 12 1/2 wonderful years with us before we lost her. I remember when we first got her, how playful and hyper she was. She was loved by everyone. As she got older, she acted just like a little old lady. Still just as loveable as ever, just sort of stuck up and set in her ways. She has been with us for so long, that it's really just hard to believe that she's not here anymore. She lived a long and wonderful life full of love. She just got tired and was ready to go to sleep. She will forever be a part of us and will always be greatly missed. Good night and sweet dreams, Prissy.